A pop star themed party is not just for a little one! Whether you’re a kid playing with a pretend mike, a clubbing 25-year-old or reminiscing about good times, music inspires the fun in us all. What better way to bring together music and parties than a party in your honour that’s a homage to your favourite pop-star? After being inspired by some awesome celebrity inspired art recently circulating on Instagram, I set out to see what a party themed around your favourite singer would look like. It wasn’t easy, but I think I’ve found an awesome selection! Beyoncé is a clear winner in the party honour stakes. There are plenty of cool ideas out there to inspire .. if you like it…now put your hands up! This elegant and stylish Lemonade themed party by Fab Events. Make sure you check their Insta account for more amazing pics from this party! This gorgeous Beyonce x Frida Kahlo cake is by Beurre in Melbourne. Catch them online or on Instagram! Why not create your own Beyonce decor with these cool stickers from LoveBoard? And here is some more Beyonce cake love! For someone whose consistently portrayed as cranky, Kanye features pretty heavily on party cakes and decor. This bunting says it all. Get it from StripestoSparkle on Etsy. This delicious looking fun quote cake is by Call Me Ginger Cakes. I had to laugh. The irony is strong in this cake by Buttercream Bandit. Check out this super cool Party Like Pablo Kanye Inspired confetti! By Everly Happy over on Etsy. There’s already a ‘Drake on a cake’ movement, so it was only a matter of time before Drake’s presence made itself felt in parties! Here is another lyrical gem by Buttercream Bandit. Sip on your favourite party beverage with these Drake lyric covered cups by BespokeBrideShop. What fun! Be like Drake with these photobooth masks! Another fan fave is Rihanna. Check out the cool stuff below. This Rihanna themed garland will finish off your cake table perfectly! It’s made by Simply Swig and is available in other varieties. And of course, cake! This one is by Solafly – all the way in the Maldives! Check out these Riri inspired cupcakes! Loving this Bruno Mars cake…(24k) magic! By MyMoniCakes in the US. Here is a Bruno Mars dessert table too! Treats made by Sitting Pretty Cakes. Who doesn’t want JT themed cookies? Available via Copypastry, they are seriously one of the coolest things I’ve seen. They even create customised cookie stamps based on your photos! Polish your party off with these Hip Hop themed balloons by Blow Me Boutique. Varieties include Drake, Rihanna, Nicki Minaj, Beyonce and Cardi B. So cool. 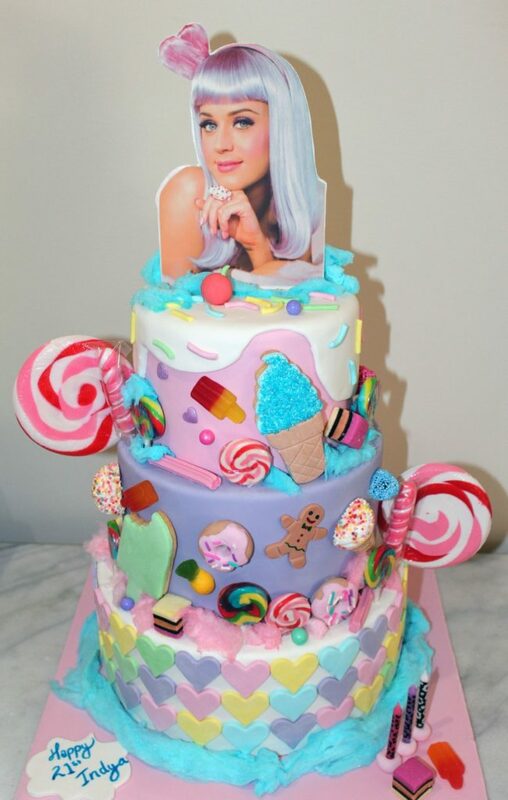 And finally this super fun Katy Perry cake from Chris Seers Catering. Have fun! If you’d like to plan a pop-star inspired party soon, make sure you follow our Pinterest board – we’ll be continually adding to it. So many cake ideas, but for organizing a theme party we also need decorations to be personalised.